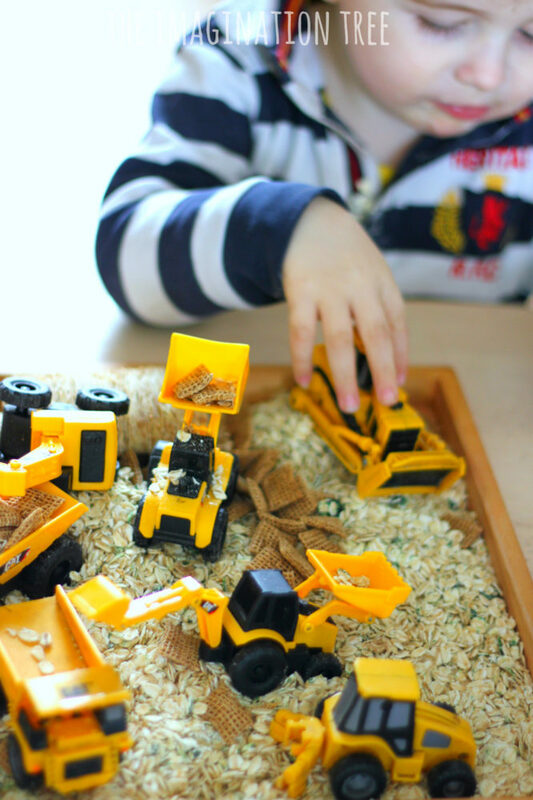 Make a simple taste safe digger sensory bin for toddlers and older babies using everyday kitchen materials! 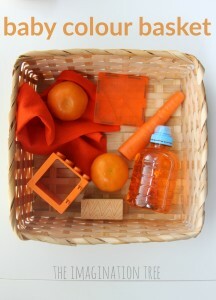 Wonderful for sensory exploration for little hands and the development of imaginative and role play too. Mr 2 is totally and completely wrapped up with diggers and “nee-naws” and already shows a strong predisposition to this sort of vehicle play, repeating it daily in large and small scale. I’ve been challenged to provide enough spaces for him to explore this fascination both inside and out and also in a safe enough way that he can play without me constantly watching. 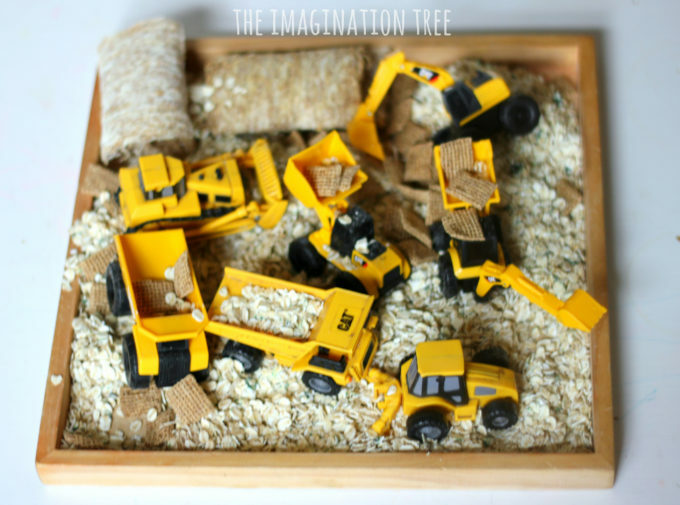 If you follow my daily play photo journal over on Instagram you’ll have already seen many digger sensory play set ups similar to this one! 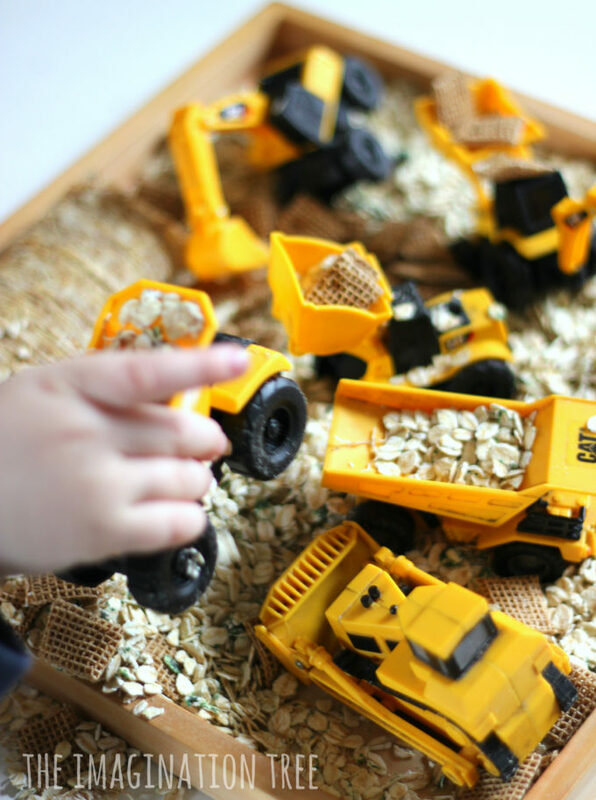 I’ve captured our latest sensory bin for toddlers in photos so that you can see the kind of thing I make for him, and how very quick and easy it is to create. Using a wooden play tray as a base (the packaging from a set of wooden blocks) I filled it with a layer of rolled porridge oats as a sensory base, then added some Shreddies and large Shredded Wheat. I didn’t use much, just a handful or so, and it will be kept in an airtight container for future play, so not too wasteful. 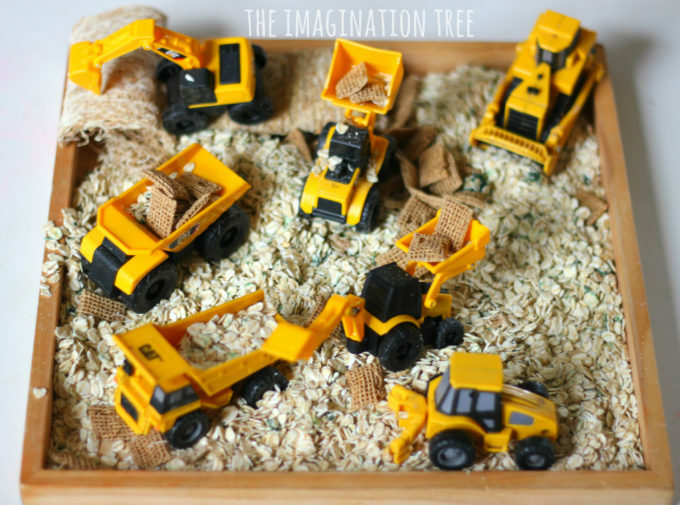 Then I added his set of gorgeous Mini Diggers (we have used these SO often for play scenes!) and he was ready to go! I usually put this on the floor of the kitchen so he can play nearby while I am busy in there, or else put the whole tray inside a larger under-bed storage box so catch the over-spill. With the lovely warm months approaching you can increase the size of this and just keep it outside with a close fitting lid added for night time. He loves rolling the diggers back and forth, filling the scoops and tipping out into heaps. He adds noises and is beginning to direct play. We have SO many TODDLER PLAY IDEAS in the archives. Pin them for later and feel inspired to return later! 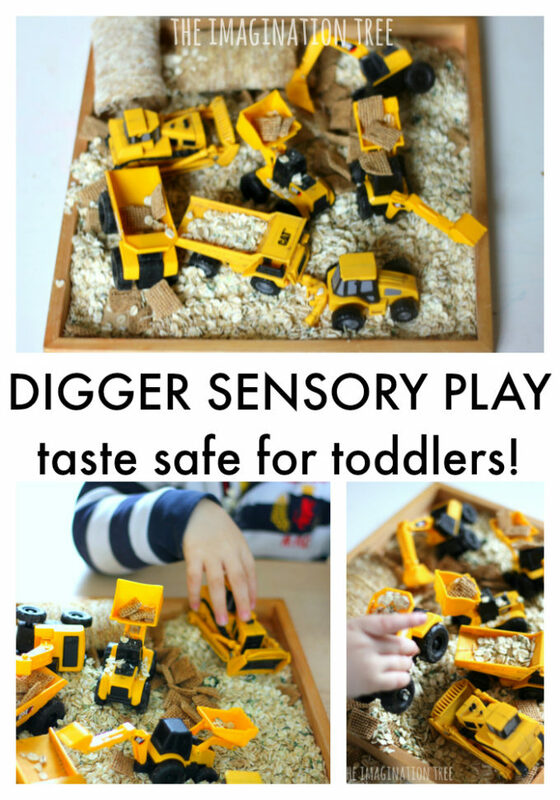 There are also plenty more DIGGER PLAY ACTIVITIES for fellow enthusiasts too! And a whole heap of SENSORY PLAY IDEAS for all ages in the archives too. 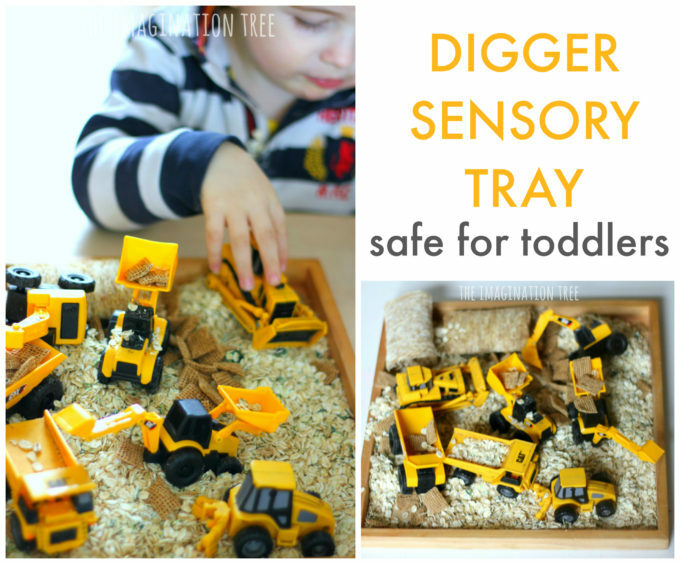 If you love this sensory bin for toddlers then please share it! Thank you for your support and readership.